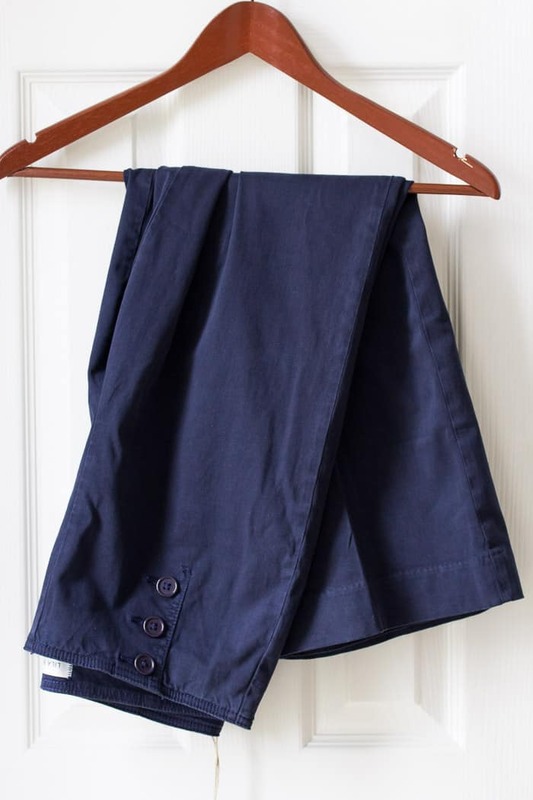 For this May 2018 Stitch Fix review, I made some specific requests for a kimono, wide leg pants, and casual clothes to wear to my son’s weekend soccer games. Now, let’s get on to what came in this month’s box of clothing! As I mentioned in the beginning of this post, I made some specific requests for this fix. I mentioned I’d like a kimono, wide leg pants that I’ve been seeing everyone else get, and casual clothes to wear to my son’s soccer games on the weekends. Unfortunately, this fix didn’t quite hit the mark. I love Level 99 pants, so I was sure I’d love these shorts. They definitely fit my request for casual weekend wear. 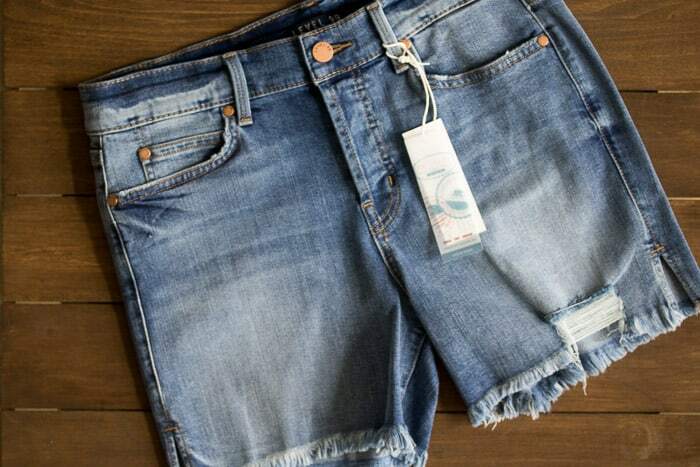 The only issue for me is that I had just bought a similar pair of distressed shorts in my first Trunk Club box. Also, these fit great, but are tighter in the thigh area. I prefer my shorts to fit a little more loosely for comfort. 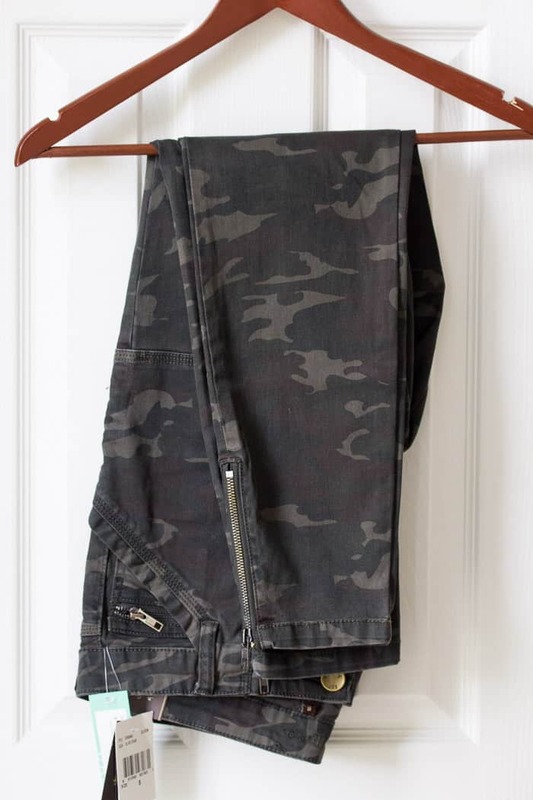 VERDICT: sold in a Facebook group for Stitch Fit items only (more on this group at the end of the post). This pair of pants is really cute, but not what I was looking for when I asked for wide leg pants. The items I noted for my stylist were far more casual and “beachy.” In my opinion, these are more dress pants and I just don’t have as much of a use for them. They seem to be really well made and great quality. I’d be open to trying other items from this brand. 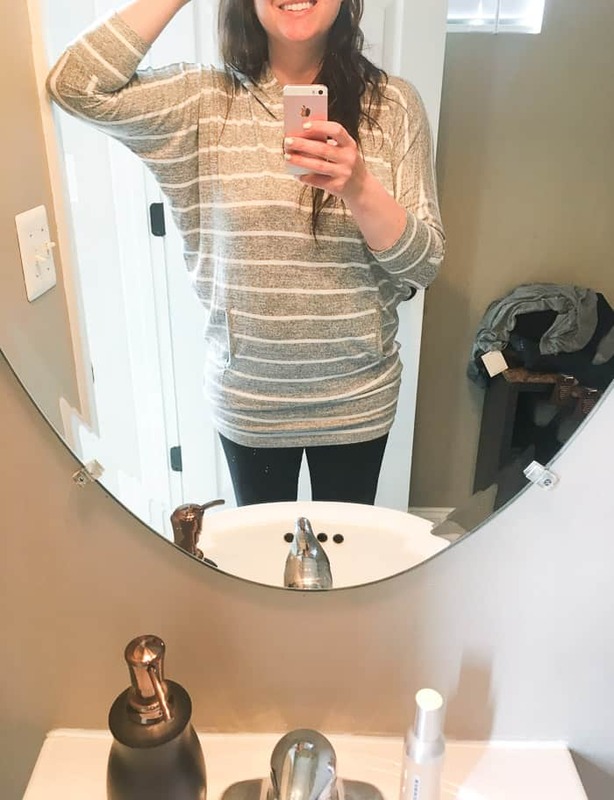 VERDICT: sold in a Facebook group for Stitch Fix items only. These pants fit perfectly! I almost kept them for myself except…camo. 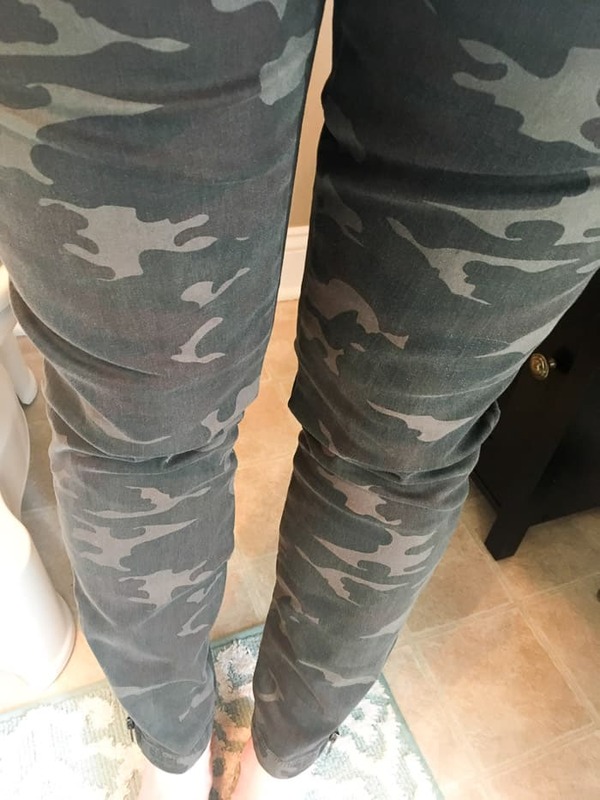 I do not do camo and these pants fit so great that I almost convinced myself to buy them anyway! Currently, Stitch Fix does not offer color exchanges. If they did, I would have bought these pants in any other color. 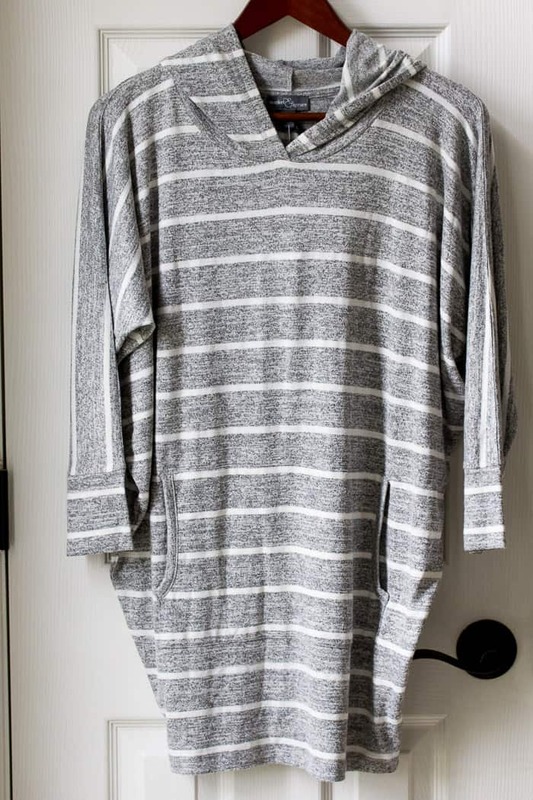 The tag on this shirt says it’s a Stitch Fix exclusive, however there is a nearly identical shirt on the Good Hyouman website for the same price. The only difference is that on the back of that shirt, it says “Good Hyouman” in small print. I went back and forth on this shirt. 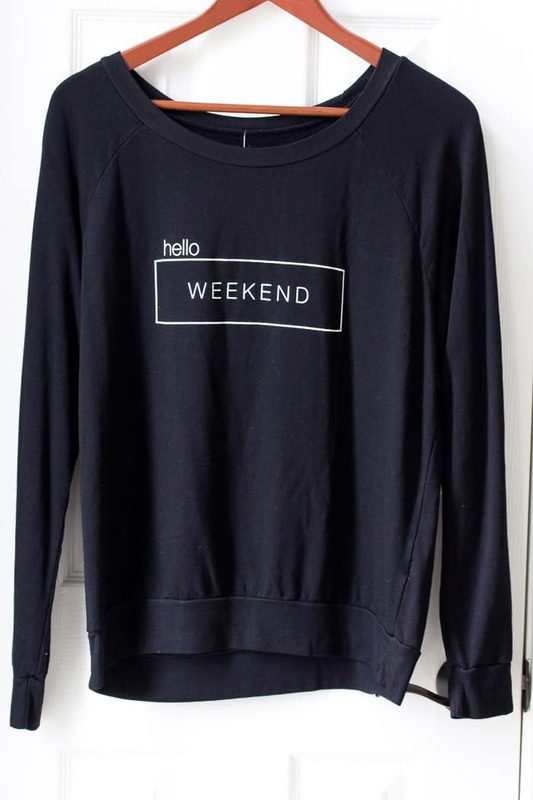 It’s super soft and comfy, but it’s more for Fall and cooler weather. I’m not going to get much use out of it at the moment, but I kept it anyway. It was just too comfy and cute to pass up! My stylist included this top because I had it pinned to my fashion board on Pinterest. At first, I wasn’t thrilled. It’s cute in the picture, but again, it’s getting hot out here and this won’t get worn much until Fall. Once I tried it on, I was in love! It’s possibly the most comfortable shirt I’ve ever worn and it fits so good. It hides everything I want to hide, while still looking really cute! I didn’t want to take it off. I’m not kidding! VERDICT: obviously, I kept this one! I guess I can kind of see where my stylist was coming from with her choices. It just wasn’t quite what I was hoping for. Thankfully, I was able to sell the 3 items I didn’t want. The Facebook group is called Stitch Fix B/S/T and Discussion. I listed the items I didn’t want to keep there for the price I paid (with the discount) plus $5.00 to cover shipping and Paypal fees. They were all snatched up pretty quickly! This made it so I could buy the whole box with the discount, but really only pay for the 2 items that I kept (with the discount!). The total for this box was $360.00. The 25% discount for buying all the items was $90.00, bringing the total to $270.00. Had I paid the $20 styling fee, that would have also been deducted from the $270.00. I don’t pay the styling fee, because I was lucky enough to be offered the Style Pass which is a one time yearly fee of $49.00 that gets applied toward future purchases. It’s an exclusive offer that you can only get if Stitch Fix reaches out to you, but I do think that ordering often helps increase your odds. For my next fix, I mentioned once again that I’d like casual clothes. This time I specifically asked for short sleeves (no sleeveless tops) and looser fitting shorts. I also requested a kimono again. I lowered the price range for tops from $50-$100 to “The cheaper the better” because it seems the casual tops I see are all under $50 which is just fine with me! 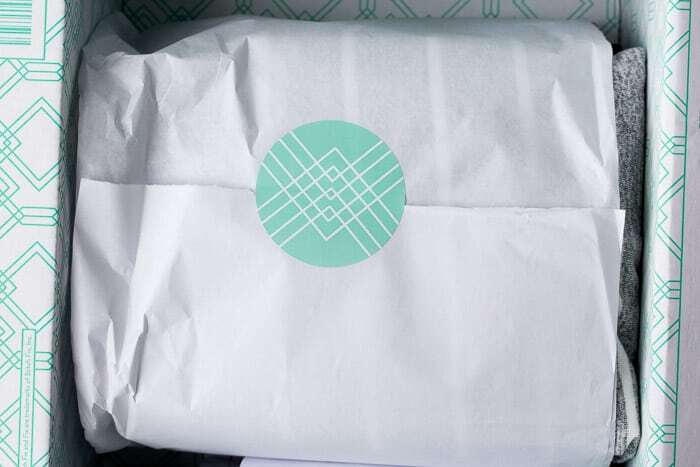 If this May 2018 Stitch Fix Review has you ready to try Stitch Fix for yourself, you can do so HERE! Make sure to be super specific about items you’ve seen and love. I would also definitely recommend linking an up-to-date Pinterest board that has Stitch Fix items you would love to get! You can see my Beauty, Fashion, and Style Board HERE and pin directly from this review, if you want!